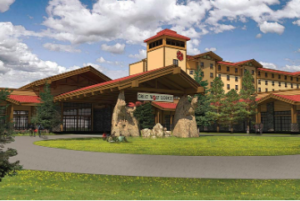 If you’re not familiar with Great Wolf Lodge, it’s a hotel and indoor waterpark with 15 locations in the United States. My family and I traveled to the Grapevine, TX locationin the Dallas/Fort Worth area, about three hours from our home. 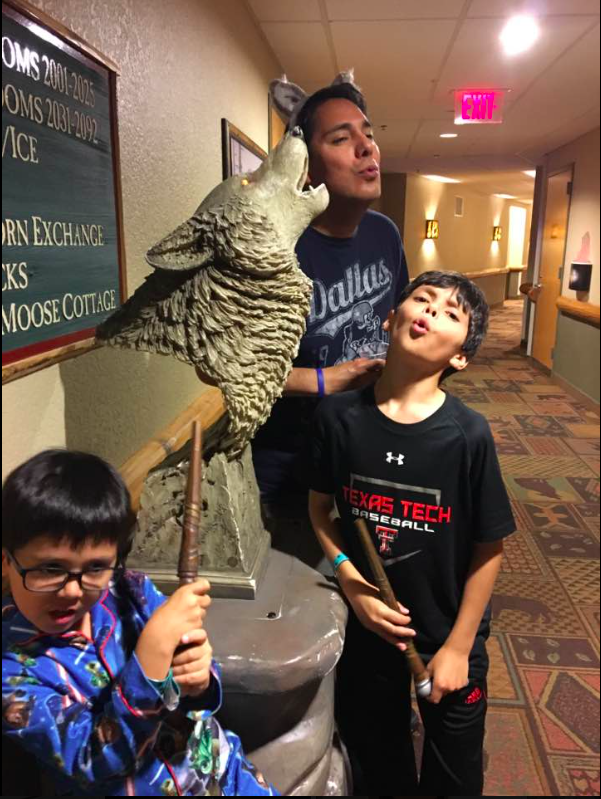 My husband and son first visited Great Wolf Lodge last summer when my oldest son started school a couple days later than my youngest. 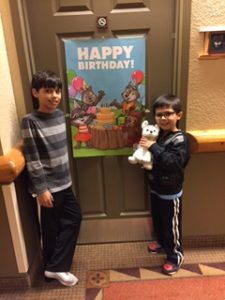 Our nearby go-to waterpark was closed for maintenance, so they headed north to spend the night at Great Wolf Lodge. They raved about their experience, especially how empty it was since most kids were back in school. Shortly after their trip, we had an opportunity to book a second trip for a deep discount. We then booked the trip with the whole family to celebrate my oldest son’s birthday several months later. We arrived at Great Wolf Lodge on a Saturday shortly after it was open to check in arrivals. I recommend getting there as early as possible because the waterpark is open to guests both on the day of check in and of check out. Luckily, our room was ready so we changed into swimsuits and headed to the waterpark. There are attractions for all ages, from the fast-moving slides to the wave pool and lazy river. The next day we got to the water park right when it opened, which allowed us quick access to the slides we enjoyed the most. After a couple of hours we took a break for lunch and some down time then got back to the waterpark. The crowds were definitely down by Sunday afternoon, and my husband’s parents and sister came to meet us and stay at the resort as well. Towels are provided and no outside food is allowed in the waterpark so you don’t really need to bring anything. You are issued a wristband upon arrival so if you do choose to purchase food or drinks from the concession stands in the park, you can charge them to your room. We saw many people bring their own insulated cups with drinks into the park, and I recommend drinking plenty of water as it is easy to become dehydrated. Once we had our fill of the waterpark for that day, we went back to the room to shower and change for dinner. We ate dinner offsite, but there are options to dine in one of the restaurants at the hotel or bring in your own food. We brought our own drinks, snacks and breakfast foods and saw several other families with large coolers doing the same. The decor of the hotel and the rooms are themed like a cabin or campground. Some guest rooms even have smaller rooms inside decorated like log cabins that house bunk beds for the kids. We had an ordinary room, but it was quite spacious and there was plenty of room to spread out to eat and watch TV when we were not in the waterpark. 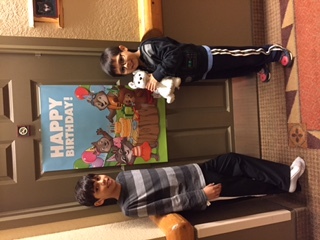 We also appreciated the “Happy Birthday” sign the staff left on our door to celebrate my oldest son. There are plenty of activities to enjoy in the hotel besides the water park, including a kid’s spa and an arcade. One of the most popular features is the Magic Quest game, which we started playing the second night. This involves purchasing a magic wand and going on “quests” in a scavenger hunt-like game throughout the hotel. If your children (or you) decide to participate in this game, I recommend purchasing it upon arrival rather than on the second day. It takes several hours to complete, but it’s fun for the kids because it’s interactive. They can wave their wands and make things talk or move to give them clues to get to the next level. It’s a nice relief from the waterpark, and it’s also good exercise as much of the game involves climbing up and down stairs to get clues in the stairwells. By the third day, my youngest son had enough of the waterpark and just wanted to play this game. There are also several free organized activities like storytime and dance parties for the kids. My sons briefly joined in a dance party one night but left when my 10-year-old decided he was too cool for it. Adults can also enjoy an adults-only hot tub or spa onsite. 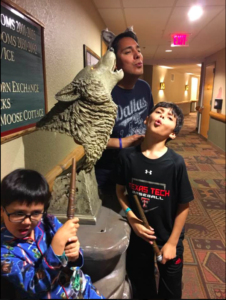 I would definitely recommend Great Wolf Lodge for a quick family getaway, especially if you can stay on a weekday when most kids are out of school. It’s also a fun way to celebrate your child’s birthday. In fact, my son said he would rather bring a couple of friends there than have an actual birthday party next year. Go early, stay late, bring your own food, and have a great time! 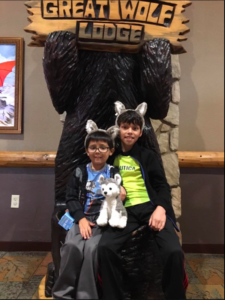 What’s your experience been like at Great Wolf Lodge or another waterpark? I’d love to hear more in the comments.